The Congressional midterm elections are often seen as a referendum on the President. 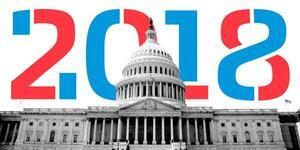 Only two politicians have seen their party gain seats in Congress in midterm elections since 1958 – Bill Clinton in 1998 and George Bush in 2002. Was it realistic to expect Donald Trump to buck the trend? How did his campaigning affect the outcome? How has his rhetoric impacted support among Republicans? How will a divided Congress function, with the House of Representatives controlled by Democrats and the Senate controlled by Republicans? And how will the relationship between the Congress and the President evolve? How will the electoral results impact U.S. foreign policy, especially towards NATO and the EU? Kryštof Kozák, Head of North American Studies Department, Charles University, and Ondřej Malý, former Deputy Minister of Industry and Trade, will attend as speakers. In Czech. The program is organized by the Institute for Politics and Society. The American Center and the U. S. Embassy Prague do not necessarily endorse the views of any speaker presented at this event.